The BWEI posted a fractional gain of .05, improving from -.40 to -.35 for March 2016 which, obviously, only means less negative. Of the eight major sectors, six remain in negative territory. Those include General Measures, Employment, Inflation, Retail, and Services. There was notable improvement in Manufacturing, which interrupted its recent freefall improving .15 from -.82 to -.67. 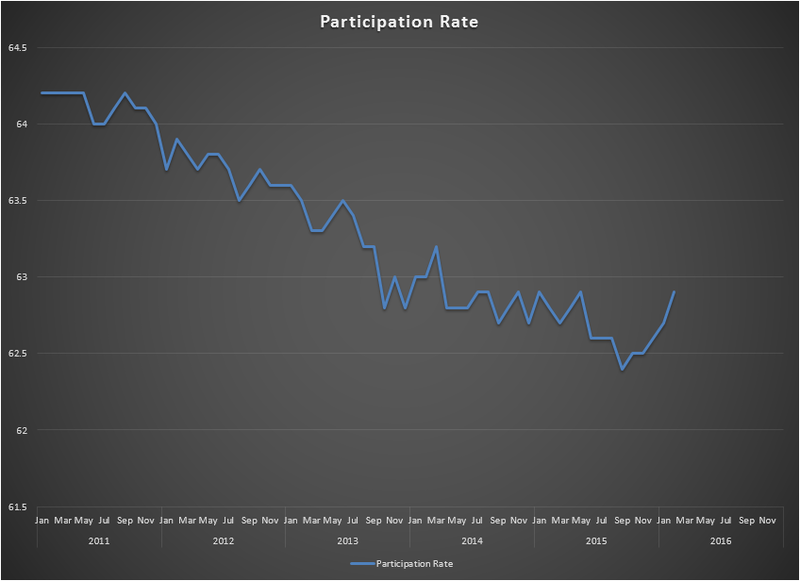 Difficulty in Retail was corroborated by the Challenger Job Cut report this morning showing the retail sector leading the way in announced mass layoffs, overtaking the energy sector for the month, but the real Retail demon in the dark has been the monthly Inventories reports showing a chilling trend in the I/S ratio. Anyone who constitutes a link anywhere in the supply chain would do well to review the most recent six to twelve releases. The two sectors remaining positive were Consumer Measures and Real Estate. However, the Consumer total lost ground, and Real Estate remained flat at .10 after a very mixed month where five out of the nine followed reports averaged in at negative values. What’s the Fed going to do? We say nothing. If you’re listening closely you’ll hear the word “recession” creeping into the media, but you’re not unprepared if you’ve been following us and that’s the point of our existence! Don’t miss the Blue World Jobs Report Analysis out tomorrow morning, and Matt will be discussing it live on WBBM AM780 and 105.9FM in Chicago at 12:09CST. Those outside of market can find the podcast at CBS Chicago later in the day. Have a prosperous April and thanks for reading! Not bad, and by that we mean mixed again. There are some higher level plusses that don’t have the kind of support we’d like to see in the detail, but we promise it has been worse. The headline is 242k, with 230k coming from the private sector, and the prior two months were revised higher. 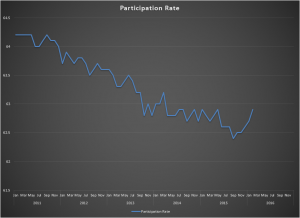 The labor force posted a nice gain of 555k, and the Participation Rate, while still sub 63, notched a third straight month of improvement. Also, the Not in Labor Force total fell again. The fact that the stats roughly balance gives us the flat unemployment rate, but we hope by now we all realize the rate is not worth considering. On the disappointing side the work week got a little shorter, and earnings pulled back a bit. The total of those reporting as Unemployed actually rose, and the manufacturing diffusion index fell to a contractionary 48.7%. We were hoping for a little better considering the late, unexpected strength from the Durables and Production reports. 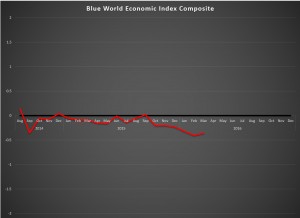 You can see more on that in the Blue World Economic Index™. The general data suggest that the Labor Market Conditions Index will remain muted on Monday, and that is what the Fed puts a lot of stock in when considering policy. If we’re looking for predictions Blue World does not feel there will be enough here for another hike at this month’s meeting but, then again, we still don’t feel there was enough for the last one. 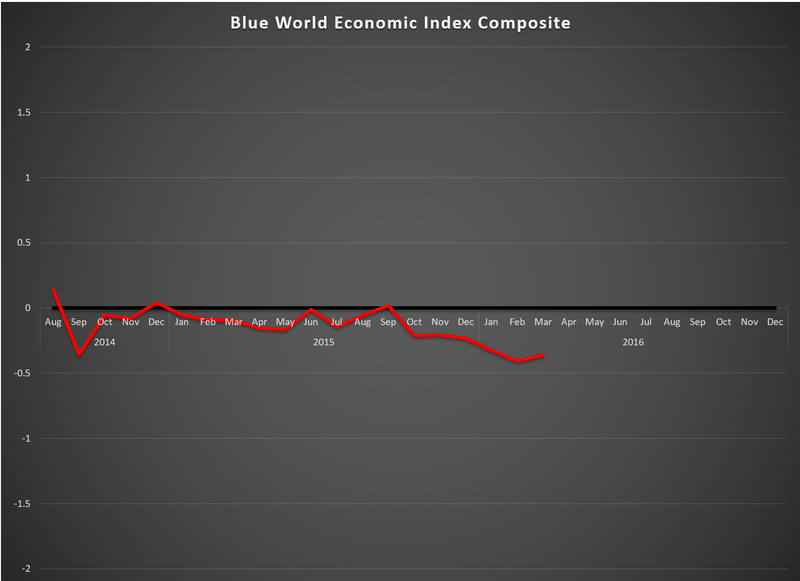 Watch for updates from us on Twitter (@BlueWorldMatt) during the month as relevant data is released and the Blue World Economic Index™ will post at the first of the month. Have a prosperous March!